have completed your high school certificate and be enrolled in or have completed a tertiary education course at an Australian recognised tertiary institution. If you have not completed a 3 year tertiary course you will also be required to satisfactorily complete a literacy test. 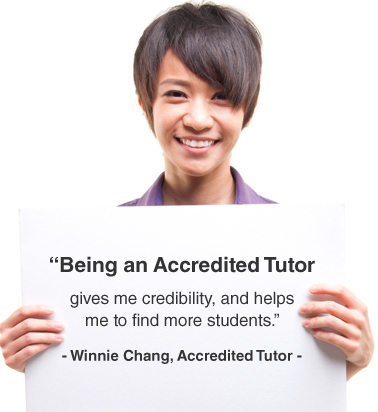 Click ‘Become an Accredited Tutor‘, we will then take you through the process of registering your account, purchasing your accreditation product and creating your profile. You will then need to meet the requirements of your accreditation which may include completing a series of online training courses, supplying documentation to verify your education background, and supplying proof of your working with children or police background check status. If you have not already obtained a working with children check or a police background check, we will coordinate a police background check for you. Accredited Tutor is an accredited agency with CRIMTRAC which is the federal agency responsible for conducting national crime checks. The cost of this check is included in your accreditation. If you have not yet completed a tertiary course, you will be required to satisfactorily complete a literacy test. To pass the literacy test you must achieve a score of 90% or higher. When undertaking the literacy test, you have the option to claim English as a Second Language. If you claim English as a Second Language, the pass score for the literacy test is lowered to 60%, but you will then not be able to include humanities subjects in your tutor profile. If you have completed a 3 year tertiary degree you may be eligible to apply for ‘Specialist’ Accredited Tutor status. Click here to read more about the requirement for Specialist Accredited Tutors. Qualified teachers are eligible for discounts and exemptions. Pricing details are provided below; click here to read more about exemptions for teachers.